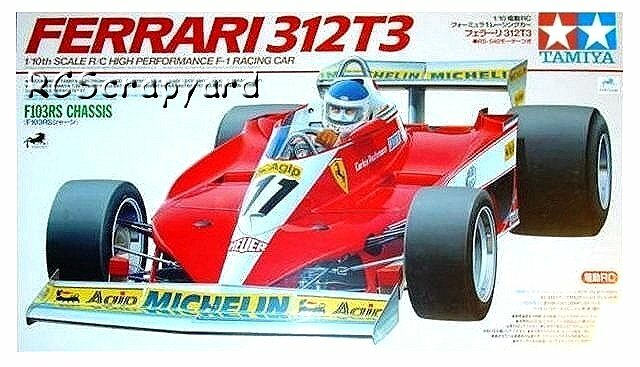 49191 • Tamiya Ferrari 312T3 • F103RS • (Radio Controlled Model Archive) • RCScrapyard. 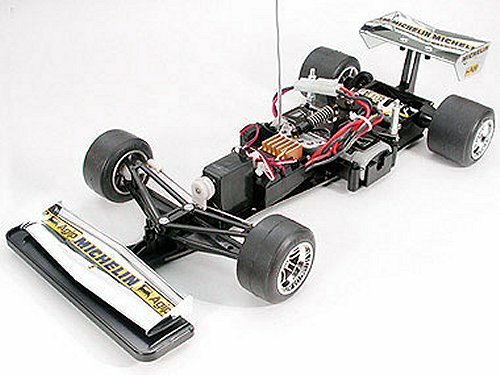 Released by Tamiya on November 21, 2001, the original Tamiya Ferrari 312T3 was based on the F1 aluminium plate chassis, with a hard plastic bodyshell. This version of the model employs the F103RS chassis and has a lexan polycarbonate bodyshell. 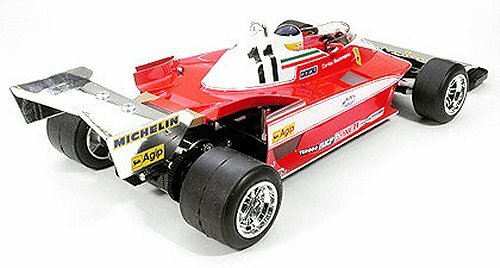 The real Ferrari 312T3 was introduced into F1 Grand Prix racing in 1978. The car had success in the Constructor's Championship, attaining 2nd place and winning 4 Grand Prix in that same year with its driver Gilles Villeneuve. Basically, the F103RS chassis is a moderately upgraded F103. Upgrades include, to reduce weight, the metal damper has holed drilled in it. The best of the upgrades was the inclusion of a knurled nut adjuster for the friction plate damper, this made fine tuning much easier. A vast array of Hop-Ups were also available. Disappointingly, the kit comes with nylon/plastic and sintered brass bush type bearings, that after a short while, when dust and grit get into them, will abrade the metal drive shafts that spin in them. If you are building this kit to race seriously these should be replaced by steel ball bearings. Some considered the F103RS to be a vast improvement over the basic model, but for me, even with the upgrades, it was only marginally better and not worth the extra cost. It was cheaper to upgrade my old F103 with the damper adjuster and a set of ball bearings … I loved that car.